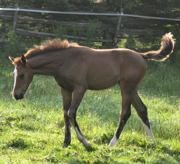 This filly shows beautiful type and is strong and sweet, with great legs and a very pretty face! Ballet Class is a repeat breeding from the sire Belissimo, by Beltain / Romadour, the phenomenal stallion who has proven he can “pass it on”. Not only was he Champion 4 Year old and Reserve Champion 5 Year old in the Bundeschampionates, he was also short-listed for the 2012 Olympics under Hayley Bresford. His offspring include many Licensing Champions, Young Horse Champions, SPS mares, and auction horses who have fetched prices as high as 572,000 Euros. Right now he is represented by Isabell Werth’s rising Grand Prix horse Bella Rose, who is considered to be one of the best young Grand Prix horses in the world. Ballet Class (pictured her from 2 weeks to 2 years old) shows powerful, correct movement, is strikingly marked and has an easy temperament. 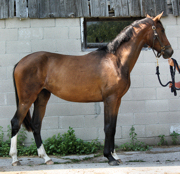 Now SOLD to Isabelle in Quebec, to be her dazzling dance partner.